We’ll now look at 11 of our French accents spoken in Acadia. 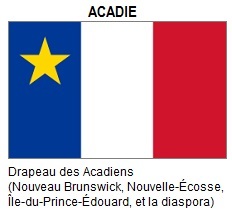 Acadia is the ensemble of Francophone regions across the Maritimes Provinces (New Brunswick, Nova Scotia, and Prince Edward Island). Even though Newfoundland French technically developed separately, from an unrelated wave of colonization (French fishermen from fishing fleets in the 1700s who decided to stay) – and thus is not part of Acadia — it is often grouped into Acadia for the sake of convenience. When it comes to Acadian accents, we’re moving into a bit of territory where I have less personal experience. In a former career, I worked side-by-side and very closely with a good number of Acadian colleagues over the years, so I’m fortunate that I’m able to distinguish between a few different Acadian accents. 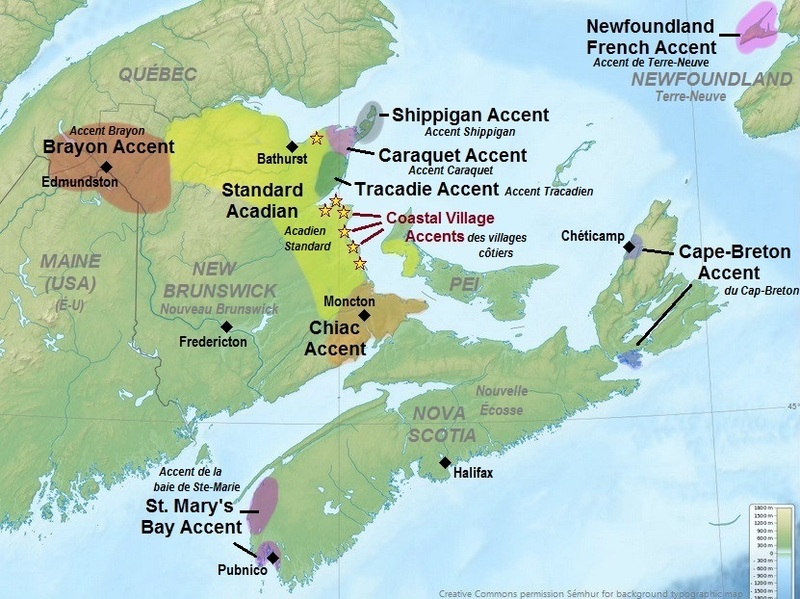 But I’ll have to keep this post relatively very general, since my knowledge regarding Acadian accents isn’t as good as is for accents further West. The numbers below correspond to the numbers on the main accent map shown in the first post in this series (click HERE to view the main map). Before looking at the regional accents, I just want to briefly mention again the context of Standard Acadian (already discussed in some length in the first post of this series). In many ways, it is closer to the original French of the 1600s from France than what Québec French is. Québec’s French was a melting-pot of a dozen or so different dialects from France – thus the original dialects had to change much more in Québec so everyone could understand each other. However, Acadian French (and its accents) originated from only 3 or 4 regions in France, all within close proximity to each other in France, and all with similar ways of speaking. Thus Acadian is a more pure echo of French from 1600s France. This has enabled Acadian French to preserve a standardized from of Acadian over the centuries (with the occasional isolated village and region evolving their own accents). This is in stark contrast to Québec French, where there has been a movement, over the last 50 years, to standardize a patchwork of parcelled accents and expressions to create a standard Québécois (Acadian did not have this need, nor this evolution — it always had the semblance of a Standard accent on which to rely on for ease of communication — and to this day there is no “French Academy” or “Office” to regulate and guide a standardization process — there simply is no great need). New Brunswick has two major, distinct Francophone regions: One is the Eastern Atlantic Coast along the Northumberland Straight / Gulf of St. Lawrence, and a second region in the interior, in the far Northwest of the Province. The interior region is centred around the New Brunswick city of Edmundston, along the American border. This region has its own type of French, with its own accent, called Brayon. The region and this localized French accent extends into Québec somewhat, influencing the French in nearby regions of Québec. The accent also extends across the border into the United States (the US border towns in Maine remain some of the only places in the United States where the population speaks French in their day-to-day lives — although this tendency is decreasing with each new generation). The river separating Northern New Brunswick from Maine is the Madawaska River, and the type culture here has come to be known as “Madawaska Culture”, complete with unique own folk songs, tales, festivals, and way of life (it’s an inland lifestyle, centred around a forests — versus Acadian culture which is highly centred around a maritime culture). I would like to mention that Chiac French, and its accent, is the main style of Acadian French spoken in the Moncton area. Moncton is a Francophone city, and is the largest Francophone city in all of Atlantic Canada. The main Francophone hospitals, Universities, Media, and Cultural hubs for all of Atlantic Canada are found in Moncton. Thus, in many ways, the Chiac accent is to Acadia what the Greater Montréal & Upper St. Lawrence accent is to Québec. Here is a video of the popular music band Radio-Radio speaking Chiac French at the beginning of this music video (Radio-Radio is rather well-known to Francophones across Canada, and they have topped the French charts across Acadia, Québec and Ontario a number of times). Chiac French can often be difficult for outsiders to understand who are not accustomed to it. The above accents are found all along the Northeast Coast of New Brunswick and the North Central interior region of the New Brunswick. As I mentioned in the first post of this accent series, YouTube has an excellent video in which a gentleman from Acadia demonstrates the various accents above. He narrates the video in a Standard Acadian accent (I gave a brief overview of Standard Acadian in the first post of this series), and then he allows us to hear samples of all the other accents listed above. The one thing he doesn’t cover are the accents of many of the smaller villages along the coast (sometimes there exists a different accent per coastal village – a real region of accent treasures). Newfoundland was home to a completely separate Francophone society – with separate Francophone customs, ways of speaking, and a distinct accent. 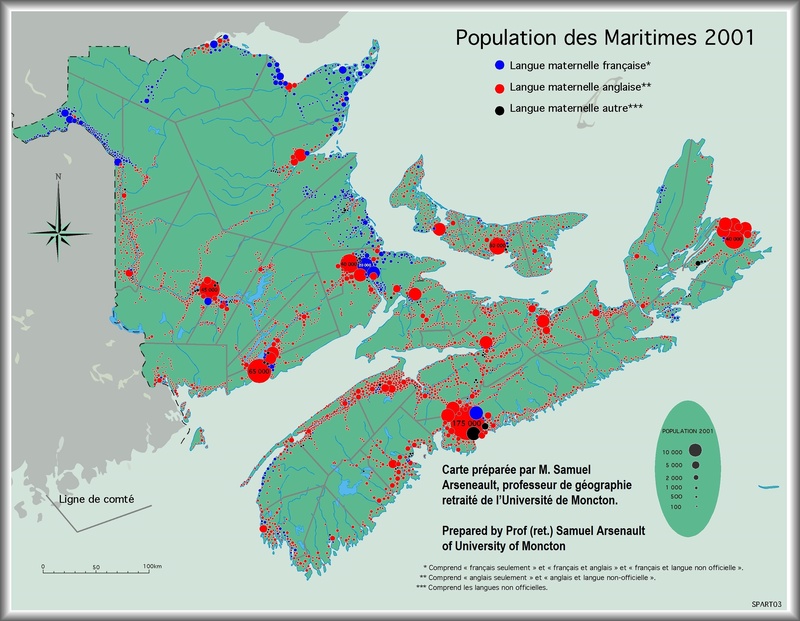 French Newfoundland was founded separately by an independent wave of settlers, not related to Acadia, Québec, or any other Francophone region in North America. But owing to the fact that Newfoundland was a direct British Colony until the 1940s — until it joined Canada — the former Newfoundland Francophone society slowly whittled away, mostly during a time prior to it becoming a province of Canada. However, we’re lucky that parts this unique Francophone heritage do still survive, particularly in a few small villages around the Port-au-Port peninsula (the furthest Southwest reaches of the Rock). 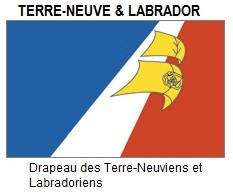 Francophone Newfoundland (& Labrador’s) official flag. I’ve been fortunate to have heard some of the last speakers of Newfoundland’s unique style of French – a couple of Francophones I met in the village of Duvernay, Alberta (a few kilometres from my parent’s summer cabin in one of Alberta’s Francophone regions) who moved to Alberta from Newfoundland for work in the oil industry. You can recognize the “original” Newfoundland French by it’s unique grammar, expressions, and its unique use of the conjugation “-ions” in the first and second person (rather than reserving it for only “nous”, as in standard French). Example: “J’étions cuisiner la pêche” (I was cooking up the fish we caught. ), “Tu venions par la’citte hier.” (You came here yesterday). Unfortunately, I’m not sure how much longer this special style of French will continue to last – speakers of the pure Newfoundland French must now be few in numbers. Younger Francophones are leaving the small villages for work, and the French language that remains in Newfoundland has generally standardized with the likes of international and Acadian French. I couldn’t find any recordings of the original Newfoundland French, of the kind spoken by the two gentlemen I spoke with in Alberta (they were perhaps in their 60’s or early 70’s, and they said they were amongst the last speakers of the original style of Newfoundland French). Any videos and recordings I’ve found for Newfoundland French are in a style similar Standard Acadian. If anybody knows where I can find recordings of the original Newfoundland French, please feel free to let me know in the comment section. I’ve never heard anything quite like their French before, and I’d love to obtain a recording of it. In the days of New France, Cape-Breton was called Île-Royale, with Louisbourg as its capital. 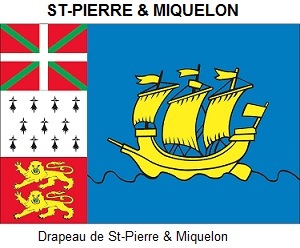 St-Pierre & Miquelon are only a short boat ride off the coast of Southern Newfoundland, but they are not part of Canada — they are an overseas territory of France. They too have a unique accent, different from any other French. But being our close neighbours and direct cousins, they and us in Canada have an enormous amount of interaction (they often make weekend trips to neighbouring provinces to buy groceries & clothes, and we go back-and-forth for simple things like hockey tournaments). We also share the events of a common history and our cultures are remarkably similar. It would be a disservice to not mention them here. Our relationship with St-Pierre & Miquelon is one of family – and there’s no doubt Canada would be there for them in time of need, and they would certainly be there for us. A clip of their French is here: (the narrator is from the Magdalen Islands, but the two people being interviewed speak with a St-Pierre & Miquelon Accent). The next post will look at our Canadian French accents in Canada’s Western Provinces. By Quebec Culture Blog 101 in Uncategorized on November 17, 2014 . Vidéo #7 n’est pas un exemple de Chic du tout. La Madame parle un Français acadien de Moncton/Dieppe. Le Chiac n’est pas précisément un accent mais plutôt un code linguistique. C’est-à-dire, l’Accent chiac va varier selon l’accent français du locuteur. Cela dit, il ya des exemples e gens qui ne parle que le chiac, mais, sous une pression sociale d’un situation particulière, ces même gens pourront changer leur “code” pour s’approcher à celle du standard. C’est complètement vrai! Le Chiac est un terme pour désigner utilisation d’un mélange de français et anglais, comme le vidéo de Radio Radio (même ti qu’il ne sonne pas exactement comme des gens de Moncton). La femme parle un français standard du sud-est du NB, pas le chiac. The lady tagged for speaking chiac, video #7, is not speaking it. Chiac is a mixture of French and English, much like Radio Radio was speaking (although their greater French accent is not from Moncton). She was speaking standard Acadian French from South-East NB.